Cover art by Gil Kane. First appearance of Red Sonja in The Shadow of the Vulture, script by Roy Thomas, pencils by Barry Windsor-Wmith, inks by Sal Buscema, Dan Adkins, and Chic Stone. 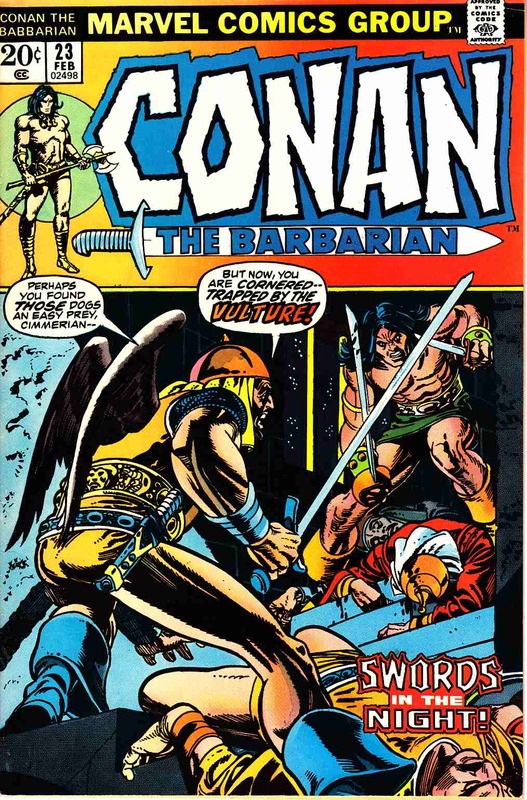 Pah-Dishah, Makkalet; Conan delivers message from Makkalet to Pah-Disha; Red Sonja saves Conan's life twice; Conan kills Mikhal Oglu (vulture) and sends his head to Yezdigerd; adapted from the non-Conan story by Robert E. Howard featuring a female warrior, Red Sonya. *Grading Notes: Severe color fading on left half of front cover (only affects front cover and not interior or back cover) not as severely faded as it appears in scan.